29-year-old mum Evgeniya Rodina clinched the first top-20 win of her career after ousting 10th seed Madison Keys 7-5, 5-7, 6-4 in the third round of the Wimbledon Championships, reaching her first-ever second-week appearance at a Major. Evgeniya Rodina continued the trend of upsets at the 2018 Wimbledon Championships as another top seed was scalped during the opening week of action — and it was a huge upset. 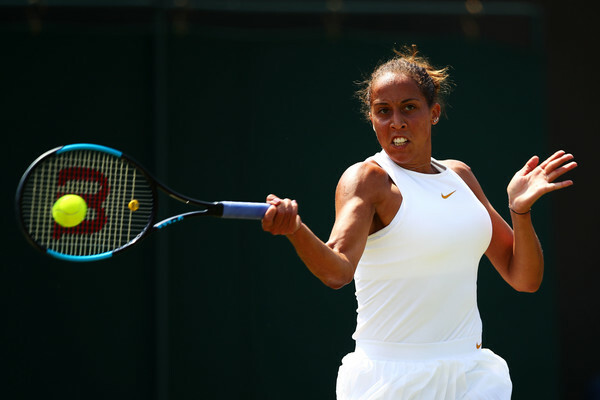 The Russian stunned 10th seed and dark horse Madison Keys in the third round of play, overcoming the American in an entertaining match to claim the win with a 7-5, 5-7, 6-4 scoreline after two-hours and 10-minutes of thrilling tennis. Keys was up and going from the start, storming out to a quick 5-2 lead within a blink of an eye but surprisingly, Rodina bounced back to rattle off nine consecutive games for a shocking 7-5, 4-0 lead and earning break points for a chance to serve out a bagel. However, Keys fought back to send the match into a decider by claiming seven of the next nine games but Rodina ultimately clinched the terrific victory, the best of her career thus far. Furthermore, Rodina recorded her best performance at a Major with this second-week run. It was the best possible start to the match for Keys, who smashed two aces past her less aggressive opponent. However, Rodina was able to challenge the American’s authority at the baseline, getting onto the scoreboard with a love service hold. Stunningly, within a blink of an eye, Keys rattled off 12 of the next 13 points with ease and strolled to a commanding 4-1 lead as Rodina double-faulted twice to get broken for the first time. Four winners, including another pair of aces, reflected how good Keys was playing as the American ultimately boosted out to a 5-2 lead after just a mere 17 minutes of play. However, Keys’ first double-fault came while she was attempting to serve out the set, and it paved the way for Rodina to break straight back as the 10th seed sent a backhand long on break point. Claiming four consecutive games, Rodina clinched the lead for the first time in the match as Keys played a loose service game with a low first-serve percentage, allowing the Russian to hit a beautiful dropshot winner to earn another break. Serving for the set, Rodina made no mistakes as she fended off a break point with the help of a poor forehand by Keys, ultimately claiming the first set 7-5 after a quick 34 minutes. Keys’ struggles continued as her second serves were being a liability towards her game, allowing Rodina to break to love in the opening game of the second set, changing the tides completely. The American’s explosive game allowed her to earn triple break points in the following game but Rodina showed some tough resilience by fighting her way back, once again aided by Keys’ abundance of unforced errors. Keys could not find the court as her big forehands often ended up miles outside the lines, allowing Rodina to earn a stunning double-break lead which she consolidated after heaving a sigh of relief, since Keys missed out on yet another opportunity to break back as she hit yet another forehand unforced error at the critical moment. Serving at 0-4 down, Keys faced four break points but she was finally clutch and showed nerves of steel, ultimately firing down consecutive aces to seal the nervy yet important game which ultimately decided the outcome of the second set. From there, Rodina completely lost the plot and conceded five games in succession, allowing Keys to earn the lead for the first time since she lost a 5-2 advantage in the opening set. An exchange of tough service holds saw Rodina having to serve to stay in the set at 5-6 once more, but this time she lost the game from 40-0 up, with a stunning backhand down-the-line return winner from Keys sealing the massive comeback for her. After a quick succession of holds, it was surprisingly Rodina who made the first breakthrough in the deciding set as Keys lost the rhythm in her game once more. The American was handing out free points with her misfiring shots, allowing the Russian to earn an early 3-1 lead as she edged closer to completing the upset once more. However, an injury scare arose after Rodina called for a medical time-out for a lower-back issue. Four consecutive breaks soon followed as neither were able to capitalize their chances on their serves, but the streak ended when Rodina had the golden opportunity to serve out the match. The Russian came from 15-30 down and produced an unbelievable forehand winner at 30-30 to set up her first match point, which she dutifully converted as Keys sent yet another forehand long.